Today I visited Readergrlz and like most mainstream book sites, it is predominantly white. Race is an issue because it defines the dominant culture; race sets the standard and that means the dominant culture calls me the minority. In our politically correct spaces you get a sprinkle of color but I feel invisible in these spaces. I want to achieve what Readergrlz does: positively impacting young people and all readers who enjoy YA literature, but I want a space full of color, a space where I don’t feel like an afterthought or token. I’m passionate about a lot of things. In this space and at Color Online, the foundation is literature- multicultural literature. It’s about inclusion, celebration, acceptance and promotion. Writer, Zetta Elliot says we need to reach out to white teen bloggers and ask them point-blankly to read, review and promote multicultural literature. The POC blog community is small and the audience we want to reach is large. We are asking: What will it take to get you to inject some color into your blogs? If race doesn’t matter to the reader, what explains the absence of color? Steph at Steph Su Reads brought this up and I’m bringing it up again. And let’s focus less on being politically correct and just keep it real. Alea at Pop Culture loves challenges. Well here’s a challenge to the teen bloggers and those who blog for teens: Add some color. Commit to reading and reviewing YA literature by and about characters of color. We want to be more than the McBook of the month. We want substantive inclusion. Why do I continue to harp on this? There are several reasons: Imagine what it must feel like to be invisible. Imagine a world where a child still prefers a doll that looks nothing like her. Imagine the impact of being judged by a standard that doesn’t reflect who you are. You want to know what this has to do with books, plenty. In books, we imagine who we can be; we look for the good in us in books. We look for inspiration. Does the main character always have to look like us, no, but what is the impact when the norm is you are not represented? And what about the impact on the reader who never sees others as the lead? What message are we sending to this reader? I’m making a 30-day challenge here. From now until August 30th, how many multicultural books will you read and review on your blog? Don't know what to read or how to make this a success? 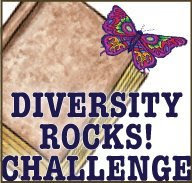 Join us for CORA Diversity Roll Call and check out books reviewed for the Diversity Rocks! Challenge. Many of you are on my blogroll or I follow you otherwise. I visit several teen sites every day. You’re invited to join me here and at Color Online. Ali at DR is one of the nicest folks you could ever meet. Visit her or cloudscome at Wrung Sponge, Edi at Crazy Quilts, Doret at Happy Nappy Bookseller, Colleen at Chasing Ray or the folks at Paper Tigers or The Brown Bookshelf. For more confessions, visit January at Poet Mom. I love it. Will help spread the word! Hmm maybe I will do a if you liked this, try that post. Like if you like Gossip Girls try Its Chicks. I am off to work, but I will think on it. We're just coming to the end of our Reading the World Challenge - so count us in! Hi Majorie, I was following your challenge and then when I changed our layout for Color Online, I lost all my links and failed to add it back. I will look and add it back. I enjoyed reading participants reviews a great deal. In fact, I've found new reads because of your challenge. I am more than willing to review as many books by authors of color or featuring main characters of color through the end of August. My review calendar is extremely swamped, but I am willing to give up some TV time to review poc books. Great challenge, and I'm going to be sure to post it on my blog! You can drop a link at Diversity Rocks! and you're entered in a book drawing. I'm not a YA reviewer, but I'd guess the absence of colour is just that white authors are the vast majority of the publishing industry. You have to SEARCH for authors of colour, you know? I'm not sure when I'll be home with library access, but if I make it back in time, I'll do your challenge! Is it just for American authors of colour, or anywhere? My "blog" is Facebook where I've recommended you and will continue to do so. I hope you received my book for the Color Online giveaway. Mayra, we have your book. Thanks so much. Eva, doesn't matter just as long as we're give some reading time and blog time to poc writers. There is a lot of YA that gets over looked. While the industry promotes and publishes mostly white authors, we readers have to be more vocal and active in promoting writers of color. If I can identify with a character who doesn't look like me, why can't a white reader identify with a poc character? All books by or about poc aren't about race/ethnicity. We're missing out on great literature. Let's change that. I support your efforts, but I can't commit to August due to prior obligations. I am ordering some poc books (does that Octavia Butler dystopia you recommended count?) and will fit them in over the long term. Yay! I'm not who you're aiming at exactly (I don't see my blog as aimed at teens and I'm certainly not one myself) but I'm going to use your challenge as the excuse to set "A Fine Balance" aside for now and get to some of those YA books in my pile by authors of color and to get to them NOW. Great idea. Good luck with the challenge. I'm in. Not sure how I'll do this with school and work but like Shalonda - Twitter/Facebook will take a backseat - will have more time to think next week. Thx for the challenge. Hi Lenore, yes, Butler counts. Some Butler isn't appropriate for the audience but if you're talking about the Parable titles, I'd say they work. Thanks. Ali, while you don't focus on YA, you do feature a lot of literature that is appropriate for this audience. Thanks for the link. KB, I know I challenge folks to see how many but it isn't about the numbers as much as it is about inclusion. I want to change the perception that reading multicultural literature means reading beyond your comfort or preferences. People of color write fantasy, horror, romance, dystopia, science fiction, bumble gum lit and everything else. Reading poc lit doesn't limit your choices, it expands them. I'm in. I just emailed Wendy who's in charge of A Novel Challenge blog. Either her or Teddy can post about it so more people will know about your challenge. Could I also use the books I used for the Apooo Book Challenge? Here is my blog addy. Yes. The idea is to have reviews in as many places as possible. I love challenges, and I think this one is especially important! I know I have a bunch of books I've been meaning to read that would be perfect for this. I've already mentioned it on my blog in my Liar post, but I will probably make an official post about it come August--once I get caught up on my library books.